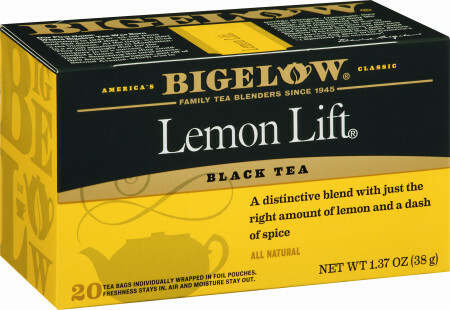 These bars are a perfect light dessert made with Bigelow Lemon Lift tea. They're always a hit with family or dinner guests. *Pumpkin Cheesecake Bars: make the graham cracker crust (below) and substitute 6 Bigelow® Pumpkin Spice tea bags for the Lemon Lift. Also omit the lemon zest in the cheesecake batter and omit the topping. **Graham cracker crust:substitute 8 graham crackers (1/3 of a 14 oz. box) for the chocolate wafers and use the same amount of melted butter. Add ¼ cup of sugar to the mixture as well. Combine hot water and tea bags and steep for 5 minutes. Thoroughly squeeze the tea bags and remove. Allow tea to cool completely. Preheat over to 350º. Meanwhile, prepare the crust. Place wafers into a large ziplock bag and crush into crumbs (alternatively, put them in a food processor fitted with the metal blade to crush). Place in a bowl with melted butter and use a fork to combine. Press firmly into the bottom of the baking pan in an even layer. Using an electric mixer beat the whipping cream to medium peaks. Set aside. In a separate bowl, beat together the cream cheese, sugar and salt until smooth. Add egg and beat to incorporate. Add ¼ cup of the tea and the zest and beat until combined. Please note this is only half of the prepared tea. Remainder can be discarded. Fold in the whipped cream and pour entire mixture over the chocolate wafer crust. Bake for 50-60 minutes, or until set, golden brown, and slightly firm to the touch. The sides will begin to come away from the sides for the pan. Allow to cool on a wire rack for 30 minutes. Remove from pan by inverting on to a cutting board, then inverting again to another board so the cheesecake is on top. Make topping by mixing the remaining 2 tablespoons of zest with the remaining 2 tablespoons sugar. Sprinkle evenly over the top of the cheesecake and cut into 16 squares.